Raghu says to Dhanak that what you want? She says you have to throw Mai out of house when I enter house. Raghu slaps her hard and shouts what are you saying? my love is true but I cant forget my mother, I cant live without my breaths, I will die without her, you said you are not like this but you are doing deals here? I dont need a relation like that, we dont have relation anymore, I end it, he cries and leaves. Dhanak looks on. Dhanak comes to mandir and wipes her tears. She takes sindoor and applies it in her forehead. She wears her mangalsutra. Raghu is breaking things in anger. Mai asks what happened? Raghu says she asked me to throw you out of house, it can never happen, he hugs her and cries. Mahindra comes to Dhanak and sees her wearing mangalsutra, he asks what is this drama? Dhanak says this is my truth, I am going to my inlaws, I cant runaway from this anymore. Mai says to Raghu that you should have slapped her, she wants me to go away from my son? good you showed her place, she brings divorce papers and asks him to sign them and end it. Dhanak packs her bag and hugs her family, all are emotional. Dhanak says to Mahindra that we have to fight for making changes in our lives. Mahindra says they are goons, you hated them and now this? Dhanak says we should give a chance to criminals too, laws say that too, I took promises from him, he has to become husband like I want, I know this is a big task but I have accepted it, bless me. He moves away. Dhanak says today I am going away and you are not doing my bidai? Mahindra says what about your future? it will destroy, why you are doing this? Dhanak says this is my choice. Mai asks Raghu to sign papers and I will throw her out of chawl. Raghu recalls his moments with Dhanak and then her condition. He signs on papers. Mai smirks. Mahindra says to Dhanak that I wont let you go there. Parag and Sejal comes there and says dont stop her, she has thought about herself for first time, let her do this. Sejal brings rice. Dhanak throws them behind her. Dhanak thinks I will pacify father but right now I have to go. Dhanak leaves. All family members cry. Mai thinks that this is sixer, Dhanak will leave his life now. Mai turns and sees Dhanak standing on door, she is stunned and says you? Raghu looks on and recalls her words. He gets angry. Mai says you are leaving chawl? this is good, did you come to say sorry? see your divorce papers, Raghu signed them as well, you wanted to throw me out of this house? Raghu threw you out of his life, take these and get lost. Dhanak looks at papers and tears them, all look on. Mai asks if she has gone mad? Raghu says I have broken my relation with you. Dhanak says its not a joke, you cant break or make it as you want, from today our relation as husband and wife starts, she asks Mai if she wont welcome her? Raghu says I live here with my Mai. Dhanak says I said it but I dont want you to throw her out of house, I was taking a test, if you do justice with her and then you will do justice with me, she is your mother and this is her house only. Raghu says you were taking a test? I am a fool, so sorry. Dhanak says its okay. Raghu asks to welcome Dhanak. Mai throws things away. PRECAP- Dhanak and Raghu are sleeping on terrace. Raghu thinks we are married and I cant even look at her, do something. Rain starts pouring, they both move under shade. Raghu looks at her and tucks her hair strand. Dhanak looks on. 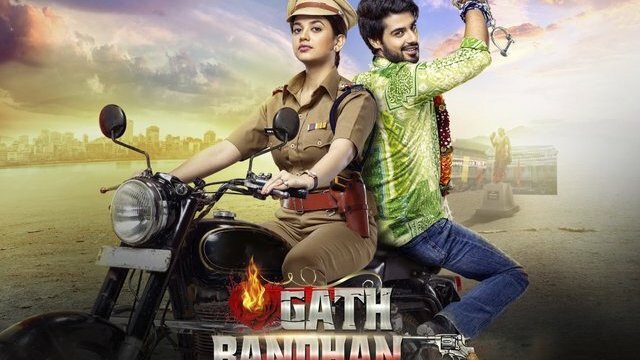 The post Gathbandhan 8th March 2019 Written Episode Update: Dhanak enters Raghu’s house appeared first on Telly Updates.